Looking for experts in precision cold heading who could save them money, a client in the hardware industry commissioned Acme Screw Corporation for this cold heading of a 4037 steel rail pin. 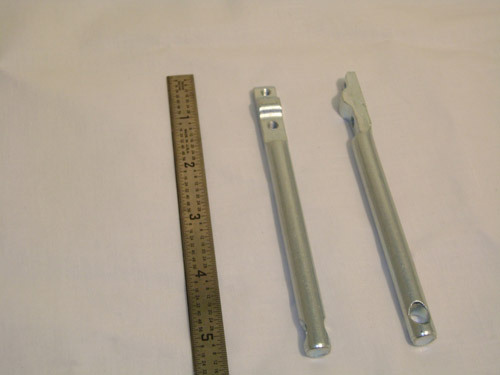 The part had previously been made using a screw machine, and our methods proved significantly more cost effective. For the formed end, we upset the .375" diameter shank up to a .500" diameter mass. Then we flattened and trimmed it in a punch press operation, creating the customer's requested shapes while maintaining tolerances of +.000/-.004". Finally, we drilled and tapped the steel rail pin, and finished with heat treating and zinc plating. The length of the final product was 5.000" and the O.D. measured Ø.375". Taking into account the cost savings, the customer service, and the high quality of our work, the client was beyond satisfied with the entire job. To learn more about this project, or to find out how our services and products can help you, please contact Acme Screw Co. 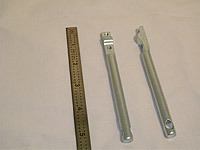 Overall Part Dimensions Length: 5.000"